New Year, New World, New PC Race! It’s a new year! Here’s hoping it brings you gaming goodness. I’ve been doing a lot of thinking and running games in Exploration Age since this blog started. I feel I have enough material to publish a book, but it need a lot of work – editing, layout, development, and it’d be great to get some playtesting feedback. The book will most-likely be a massive endeavor unlike any I’ve taken on. I’ve never even created a print product on my own! To that end, I’ve decided to switch my focus for a while to a smaller world so that I can get my feet wet. Exploration Age will not go away. I’ll still be playing games in that wonderful world, but it may be some time before consumers get their mitts on it. So with that in mind, I want to focus on the smaller, but evocative world of Enora the Bound Sky. I’ve already written about this world in two different posts, One-Hour Worldbuilding and 5 Campaign Worlds for Your Next D&D Game. If you want a quick summary, read on below! Six floating cities hover above the darkness of Enora in Bound Sky. 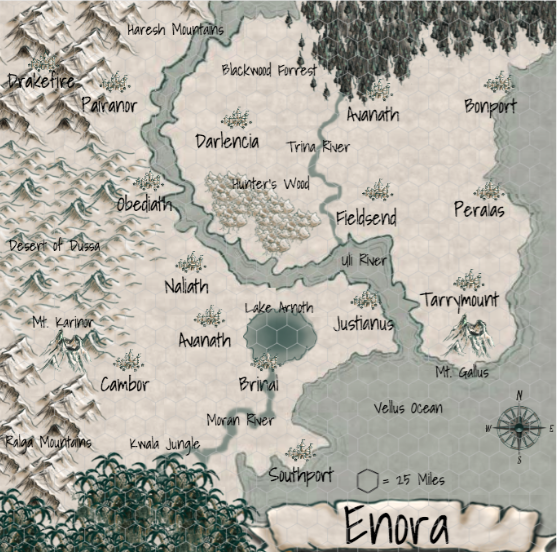 Once a prosperous nation, Enora was home to humans, elves, halflings, gnomes, and dragonborn. The country was run by the Dordune, a council of mage governors, each acting as the leader of one of Enora’s thirteen major cities. Beneath Enora’s surface, the nation’s dwarf and tiefling allies lived happily in the kingdom of Drakefire. Except for the occasional marauding gnoll pack or angry dragon, all was well in Enora. Any threats which appeared were dealt with swiftly and efficiently by the Dordune. Fifty years ago Governor Kira Vae, an elf wizard, was nearing the end of her long life. Some say fear of death gripped the governor, others say it was an unsatiated lust for power. Whatever the reason, Vae transformed herself into a lich. The transformation warped her mind, seeding a dark hatred of all life in her heart. The lich declared herself Empress of Enora. Empress Vae turned the citizens of her city, Cambor, into an undead army. The rest of Enora tried to stand against the threat, but so sudden and severe did the undead strike that seven of Enora’s cities fell to Vae. Every victory added more soldiers to her undead ranks. Messengers were sent to Drakefire, asking for military against the undead legions, but the underground kingdom was already over run by Vae’s minions. Any survivors from Drakefire had already fled even deeper underground by the time the messengers arrived. As the armies of Empress Vae closed around Enora’s six remaining cities, the Dordune made a decision to enact a powerful ritual which raised the cities and their people into the sky away from Vae and her undead. Away from a fight they knew they could not win. As the cities rose, Vae swore to eradicate the rest of Enora’s living. She is eternal as is her hate for all people who defy her. Now the six floating cities of Deldoroth find themselves safe from Empress Vae’s undead, but they have their own troubles. With limited land to produce resources, the six cities have begun treating each other more like separate countries than one cooperative nation. The Dordune have disbanded and each governor acts as a city’s monarch. As competition for food, water, and shelter grows each day, many less fortunate turn to a life of crime or legal savagery to survive. Airships transporting goods from one city to another are wary of pirates, and many make a killing or die trying in the cities’ gladiatorial arenas (which were introduced by the governors to help control population growth). Beneath Deldoroth, dead Enora can no longer be seen. Thick layers of black clouds hang between the floating cities and the surface. The undead built massive stoves and constantly pipe ash into the sky to blot out the sun they hate so much. Sometimes at night the victorious howls of the undead can be heard through the blackness by the people of Deldoroth. It is an unsettling reminder that Enora is no longer their home and what drove them out long ago still hungers for them. The situation underground is no better. Resources are scarce in Redwind, the last remaining city of Drakefire. Plenty of unsavory beasts that burrow made their way underground when the undead took the surface. Everyday the hoard bangs on Redwind’s doors and it is only a matter of time before they break through and devour the residents… if disease or starvation doesn’t take them first. So in the coming weeks, prepare to hear more about the world of Enora. In the meantime, may I present for your consideration…. the dwiefling PC race. This is in its rough stages, so take a look and let me know what you think! In the crowded city of Redwind, some dwarves and tieflings have married, producing dwiefling offspring. Dwieflings walk in multiple worlds like other mixed races, but because they grow up in a densely packed city from which there is no escape, they cannot run from odd looks, name-calling, and occasional violent reactions. Though most know taking on a dwiefling mano a mano is a dangerous idea, since they have the toughness of dwarves, the suspicious nature of tieflings, and the self-reliant values of both parents. They are versatile and dangerous adventurers who dare to wander the unsafe halls of Drakefire’s fallen cities. The boldest dwieflings make trips to the surface to scout for more resources and spy on the undead legions of Empress Vae. Dwieflings have the basic body structure of dwarves, but stand a bit taller. They are just about 5 feet tall, stout, and compact, weighing 200 to 300 pounds. Many share the blunt tongue of their dwarf ancestors as well. Yet there is no hiding the infernal blood of this race. They have the horns and pupil-less eyes of a tiefling, though they lack a tail. Their skin is often purple, red, brown, or black. Perhaps the most unique feature of dwieflings is complete hairlessness. They do not have a single follicle on their heads, faces, or bodies, including eyebrows. A life as outcasts in a city they cannot leave makes dwieflings suspicious of everyone they interact with at first. Most people find them closed off, or even cold. A dwiefling’s trust is difficult to gain, but once it is won, there is no greater ally. They place great importance on the bonds shared with their few close friends, and fiercely defend those allies with a passionate tenacity. Those closest to a dwiefling can even engage their friend in a reasoned debated, something that many fear to attempt with good reason. The temper of dwieflings is legendary. Most carry an innate anger and explode with words, fists, or spells when provoked, particularly when their heritage is mocked. This causes many closet racists to just give a passing dwiefling a funny look, while other bigots ignite that infamous temper to start a fight for amusement. The latter often regret this decision, since the sturdy dwieflings rarely lose. Because dwieflings and their parents are often shunned by others in Redwind, most try to keep to themselves. They lurk in dark corners or small alleys, pursuing artistic crafting hobbies, reading ancient lore, or practicing with steel or magic. Dwieflings sometimes pursue these self-taught skills to the point of obsession and become experts in these crafts, though no one else may know it. Dwieflings usually have a dwarf or tiefling name, given to them by one of their parents. Your dwiefling character has the following racial traits. Ability Score Increase. Your Strength, Constitution, and Intelligence scores each increase by 1. Age. Dwieflings mature more slowly than humans and are considered adults at around age 25. They can live for 150 years. Alignment. Dwieflings tend to trust in themselves and are very loyal to the few friends they make. They often favor a neutral alignment. Size. Dwieflings stand about 5 feet tall and weigh around 250 pounds. Your size is Medium. Darkvision. Your infernal heritage and dwarf blood grant you superior vision in dark and dim conditions. You can see in dim light within 60 feet of you as if it were bright light, and in darkness as if it were dim light. You can’t discern color in darkness, only shades of gray. Expanded Knowledge. You gain proficiency in one set of artisan’s tools or melee weapon of your choice or one of the following skills: Arcana, History, Nature, or Religion. Hellish Bind. When a creature hits you with an attack that deals damage, you can use your reaction to force that creature to make a Wisdom saving throw as your pain imparts psychic visions of torture to it. The DC for this saving throw equals 8 + your Constitution modifier + your proficiency bonus. On a failure, the creature is stunned until the end of its next turn. After you use Hellish Bind, you cannot use it again until you finish a long rest. Languages. You can speak, read, and write Common, Dwarvish, and Infernal. James, you have done an amazing job as a world builder. I’m very impressed with the quality. I’m still in the early stages of planning my take on an Enora campaign. We’ve done a Session Zero and made characters. My two players (my 11-year old twin boys) want to play a pirate campaign. I figured, what’s better than pirates? Sky Pirates! Enora is a great setup for a gonzo pirates. Not going to be going to the ground at first, but I can’t wait to use the dwieflings. I really like the flavor of the hellish bind. Thanks!!! I am excited to design for this world. Let me know how your games go. I hope your sons have a blast!